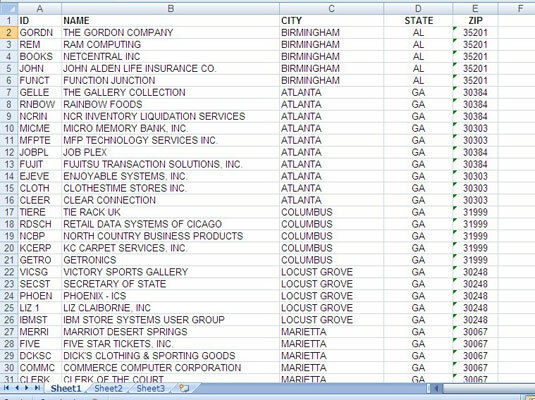 If your Excel 2007 worksheet has become quite large, using the Sort dialog box to sort on multiple columns can make it easier to find the data you need. The Sort dialog box lets you tell Excel what column to sort on next if two cells in the main sort column contain the same value or data. Although the most common sort is by rows (top to bottom), you can also sort by columns (left to right). In the Sort dialog box, click the Options button, choose Sort left to right, and click OK.
1Select or click in the list of data you want to sort. 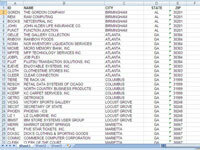 You can select only a single column of data if you want to sort that column independently of the rest of the data. However, in most cases, you likely want to sort the entire list. 2Click the Sort button in the Sort & Filter group on the Data tab. The Sort dialog box appears. If your data includes column headings, make sure the My Data Has Headers option is checked. Excel can usually detect the correct setting automatically. 3From the Sort By drop-down list, select the column by which you want to sort. This drop-down list includes the column headings for each column in the list. 4From the Sort On drop-down list, choose Values. Notice that you also can perform the sort on Cell Color, Font Color, or Cell Icon. Typically, you will perform a sort based on values rather than formatting. 5From the Order drop-down list, select how you want to sort the data. The options that appear in this list change based on the contents of the sort column. Choose A to Z or Z to A to sort text values, Smallest to Largest or Largest to Smallest to sort numeric data, or Oldest to Newest or Newest to Oldest to sort by dates. 6Click the Add Level button. Additional drop-down list boxes appear for the secondary sort column. 7From the Then By list, select the secondary column you want to sort on. This is the column Excel will sort by if two or more items are identical in the first Sort By option. 8Select how you want to sort the second data criteria. After you specify the options for the secondary sort column, you can add more sort columns as needed. Use the Move Up and Move Down buttons if you decide to change the order of the sort columns. The dialog box closes and Excel performs the sort process.